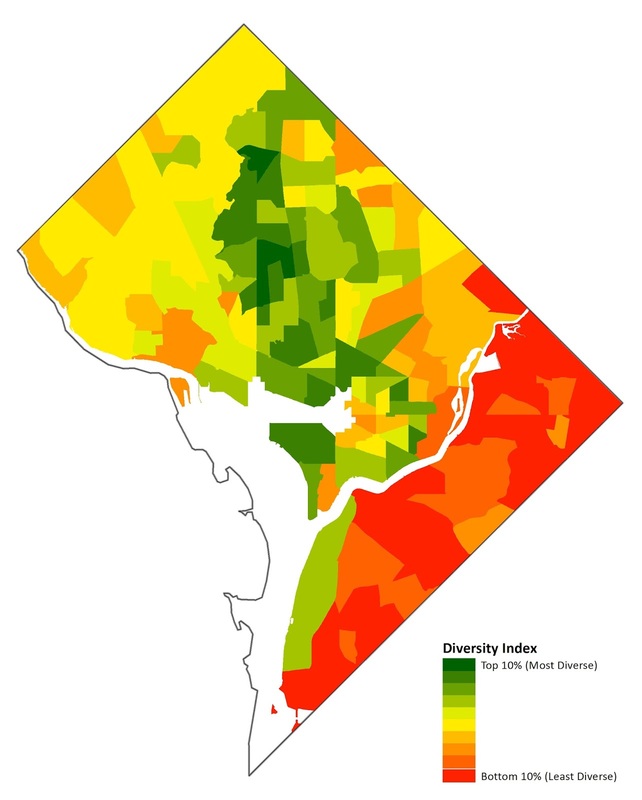 Thirty-two percent of black people born in DC still live there, but only 4% of white people born there do. 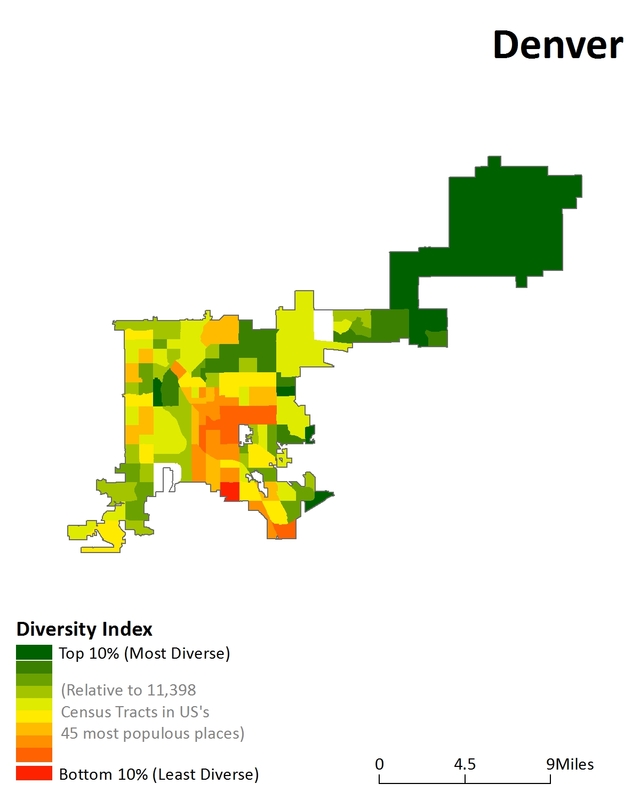 Where they've moved to also differs greatly by race. This disparity arose from racial and racist policies in our history. Last year, The New York Times created a set of fascinating charts that illustrate migration patterns between US states. 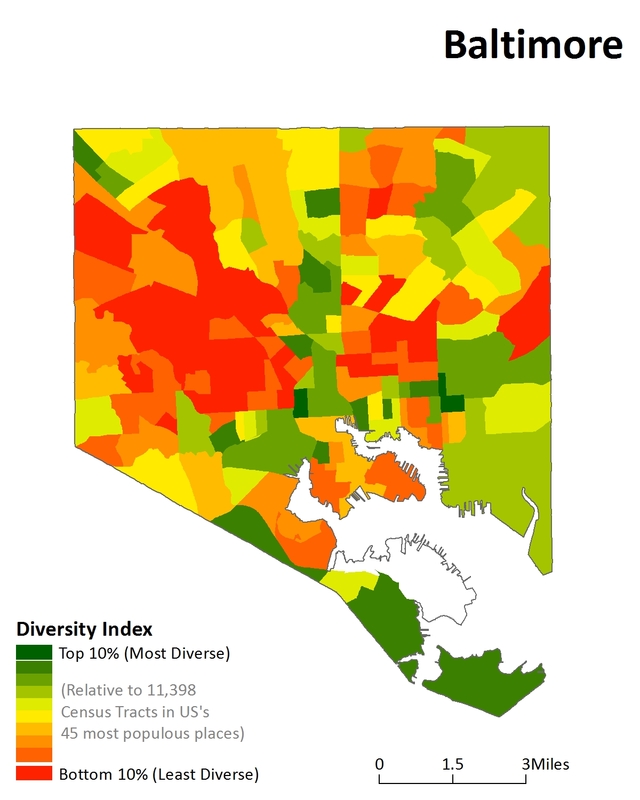 The out-migration chart for the District showed that almost half of the people born in the city had moved to Maryland or Virginia. 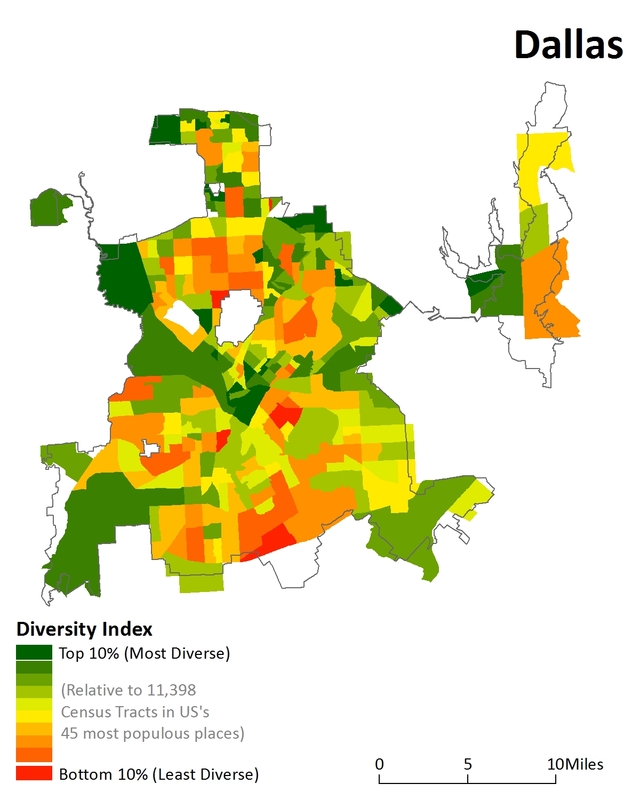 The experiences behind these figures differ greatly for black and white Washingtonians. 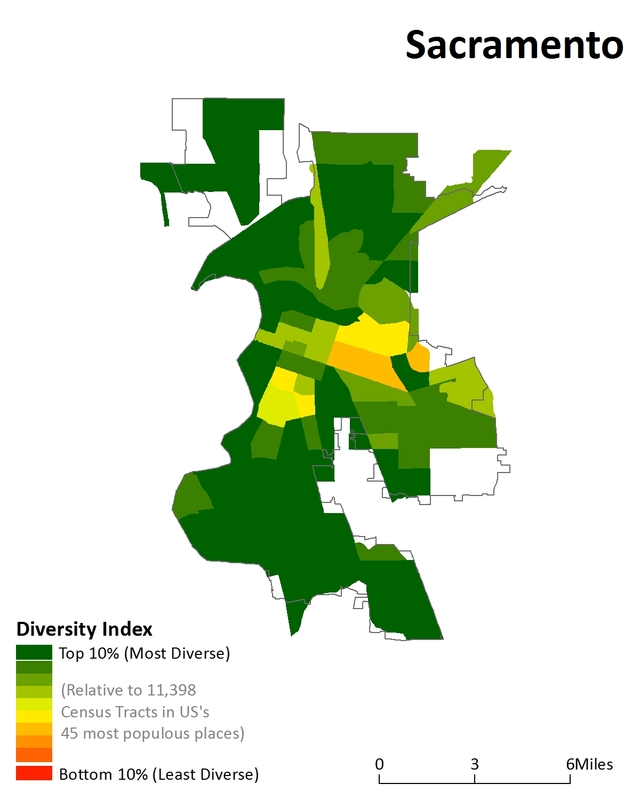 These two graphics attempt to break down the original chart to tell these two distinct stories, using data from the US Census Bureau retrieved through the University of Minnesota's Integrated Public Use Microdata Series. 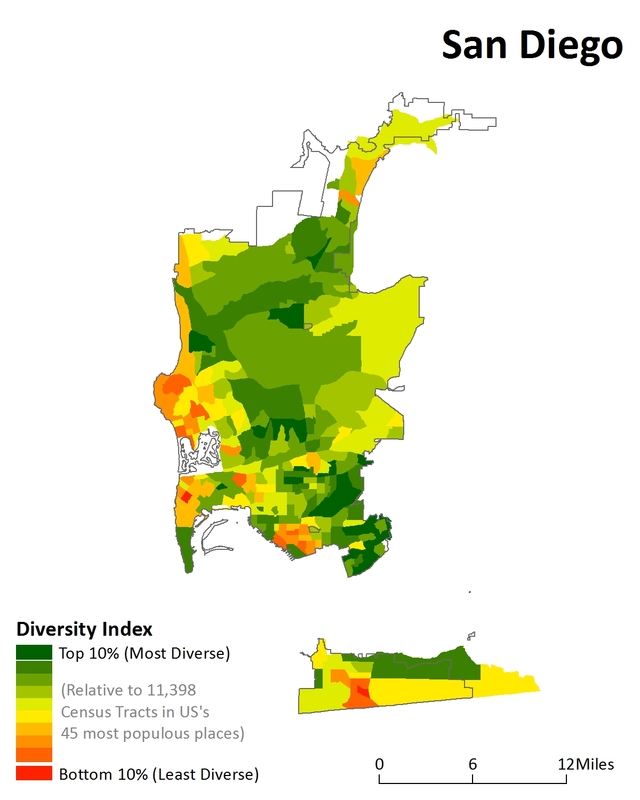 All numbers and percentages discussed only represent movement between the District and other US states; they don't represent migration out of the country. White Washingtonians first began moving to Maryland in droves in the 1940s (that's the first big bump in the second chart), but blacks were excluded from this migration pattern for another three decades. Private housing developers and neighborhood associations used restrictive covenants to ensure that only whites would live in these communities (this practice was occurring within DC as well, and everywhere else, and had been commonplace for decades). Most public housing developments, such as those in Greenbelt, Maryland, developed in 1937 for whites-only, were segregated too. In 1948, the Supreme Court ruled that the government could not legally enforce these covenants. Private parties, though, could continue to honor the terms, and they did. 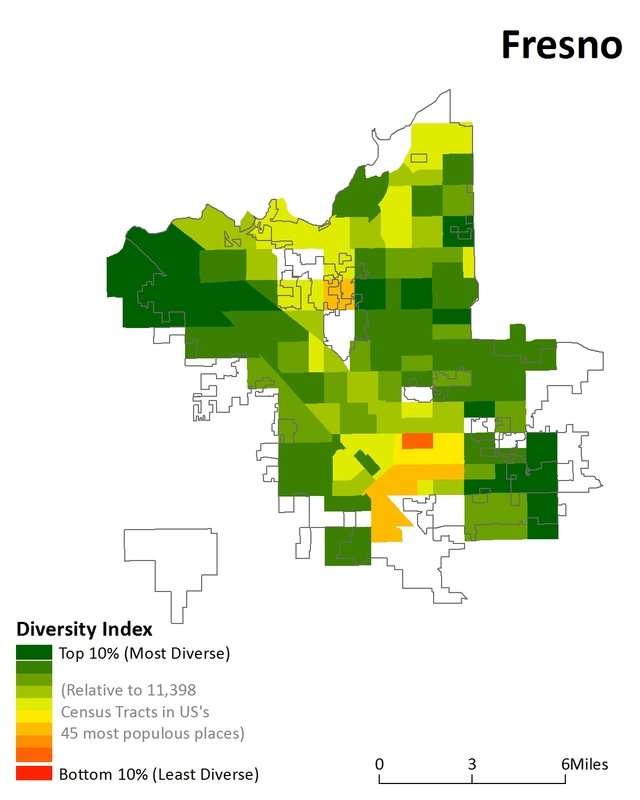 In addition to being excluded from white neighborhoods, which included almost all communities adjacent to but outside of the District, black Americans faced other forms of harsh housing discrimination. Federal intervention in the mortgage industry revolutionized the housing finance system in the US starting in the 1930s and 40s by supporting cheap, long-term mortgages with low down payment requirements. But only whites were able to take advantage of these products. In the National Capital area, two-thirds of these loans were made to homebuyers outside of the District's boundaries and almost all loans, everywhere, were made in predominately-white areas. Add to the mix the practice of racial steering and the reality of gaping income disparities between blacks and whites, and it is no surprise that before the 1970s, less than 10% of all District-born blacks lived in Maryland and Virginia (including all the cities in those states, not just the communities close to DC). 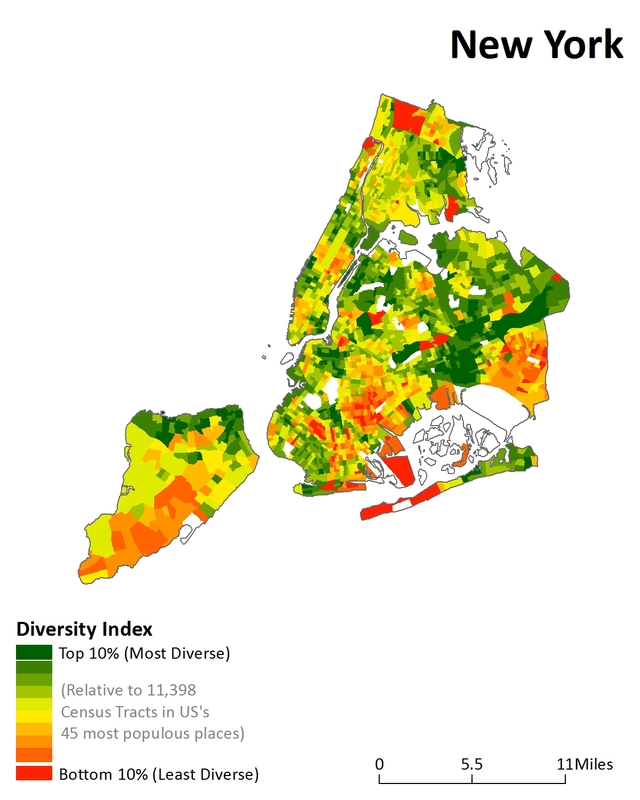 The Fair Housing Act of 1968 did not eliminate race-based housing discrimination, but did make it illegal, vastly increasing minority access to areas from which they had been previously excluded. 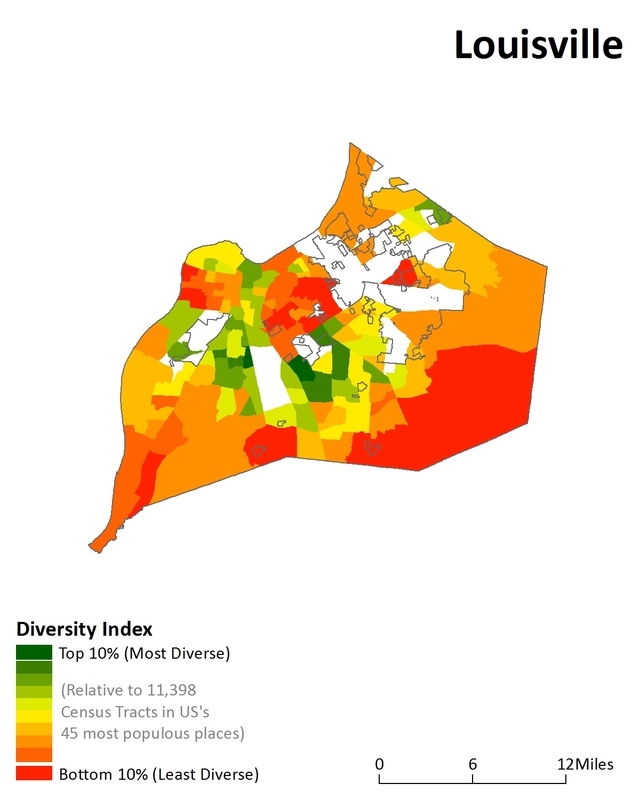 In 1970, 8% of District-born blacks lived in Maryland. By 1980, that share more than tripled to 27%. Black migration from DC to Maryland continued to increase from 1980 to 2000, but at a slightly slower pace. It has since plateaued, with approximately 44% of District-born blacks now residing in Maryland. 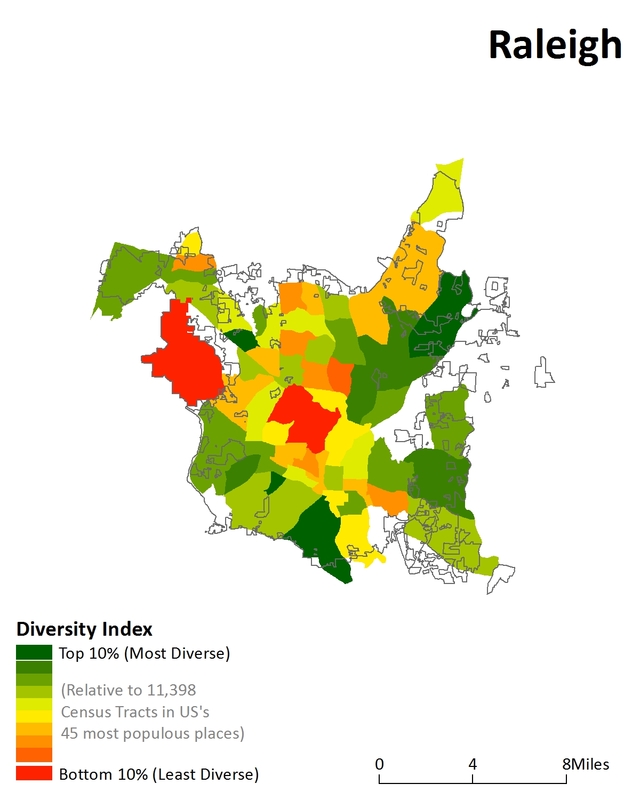 Most of the moves the District-born black population has made over the last four decades have been to Prince George's County. 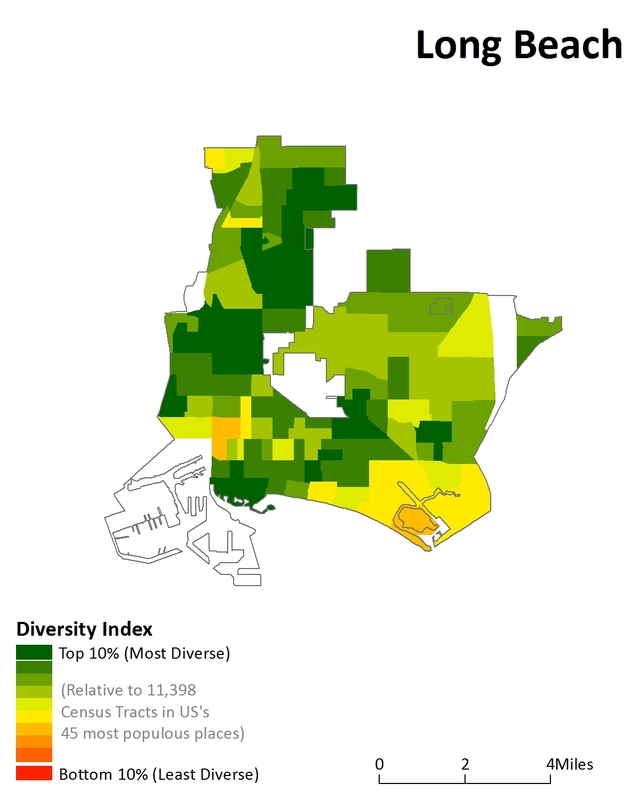 More District-born blacks live in Prince George's County than live in the entire District of Columbia, with 33% living in the county. However, that percentage seems to have leveled off and remained steady since 2000. 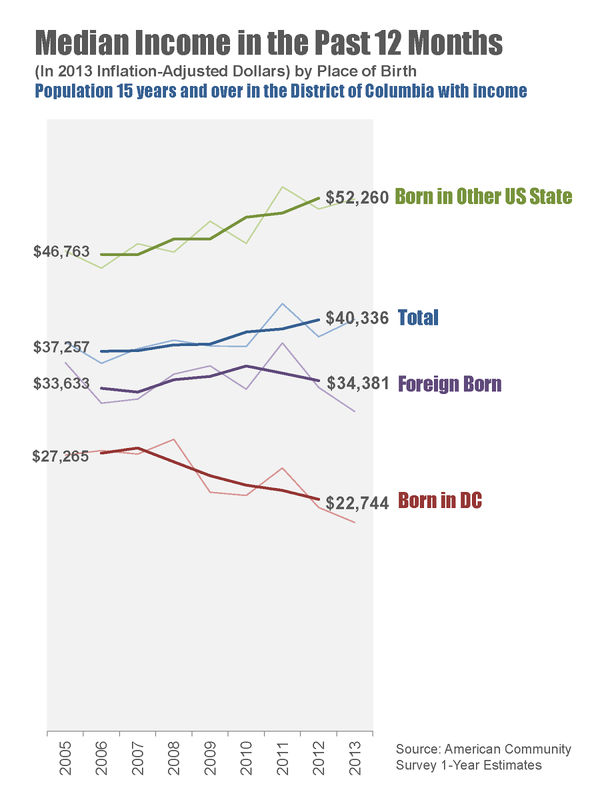 More and more DC-born blacks are heading to new destinations, both in nearby places like Charles County (70% increase between 2000-2010) and more distant ones like North Carolina (46% increase between 2000-2010). 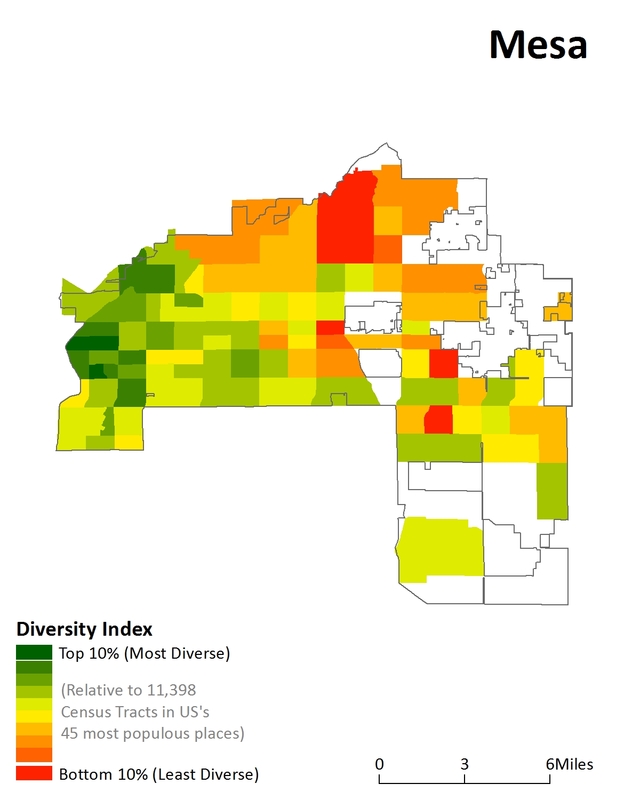 There are more District-born blacks in North Carolina than there are in the entire Northeast region of the country, and more than in the entire West and Midwest regions combined. 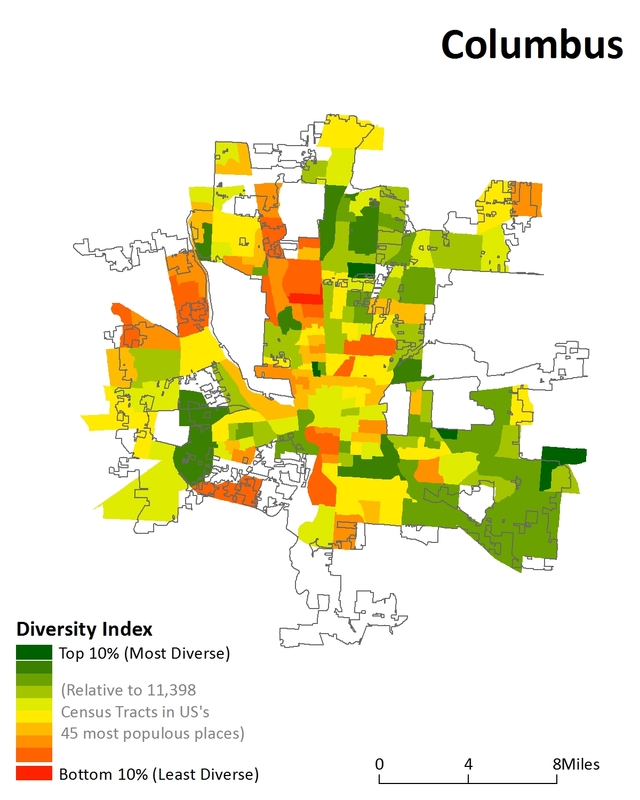 Many are moving to other parts of the South too, with notable clusters emerging in and around Atlanta and Memphis. 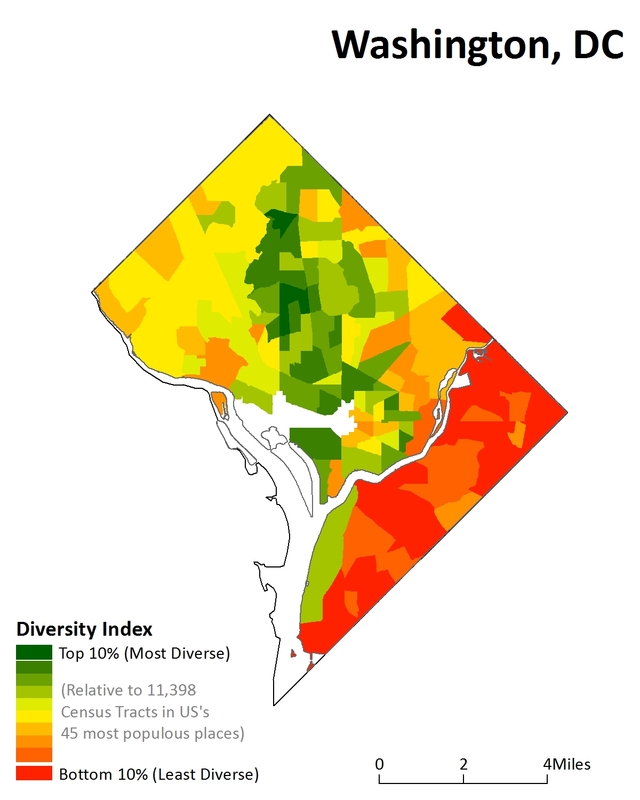 Very few white people who are born in the District stay there, although that trend appears to be reversing slightly after reaching a low point in 2000, when the percentage was less than 3%. The history behind these figures has been partially described in the paragraphs above: whites enjoyed all of the opportunities blacks were denied. Huge numbers of white Washingtonians left the city between 1940 and 1960. About 42% of those who left moved to Maryland, and 17% moved to Virginia. Small but growing numbers moved west and south, particularly to California and Florida. 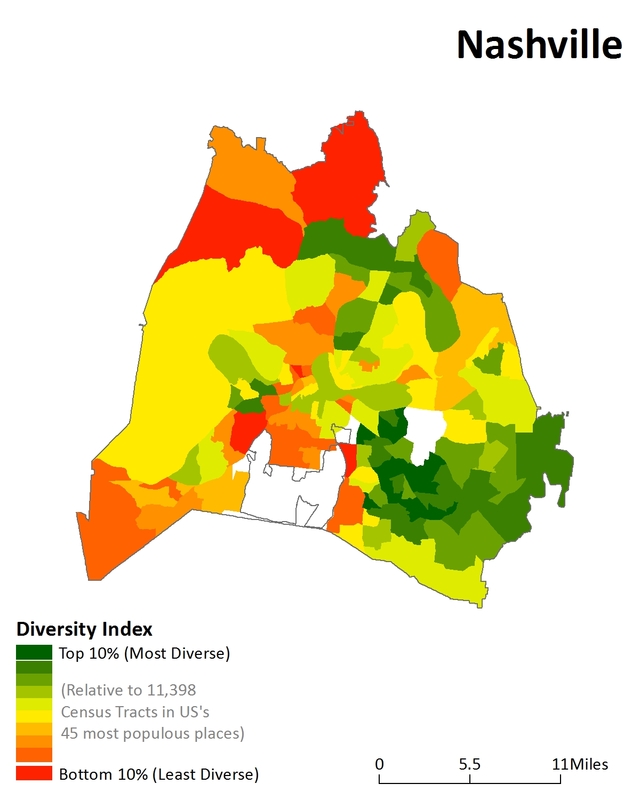 These trends continued, but after 1990 Maryland started to see its share of District-born whites decline as people continued to move increasingly West and South (a trend not unique to those born in DC). 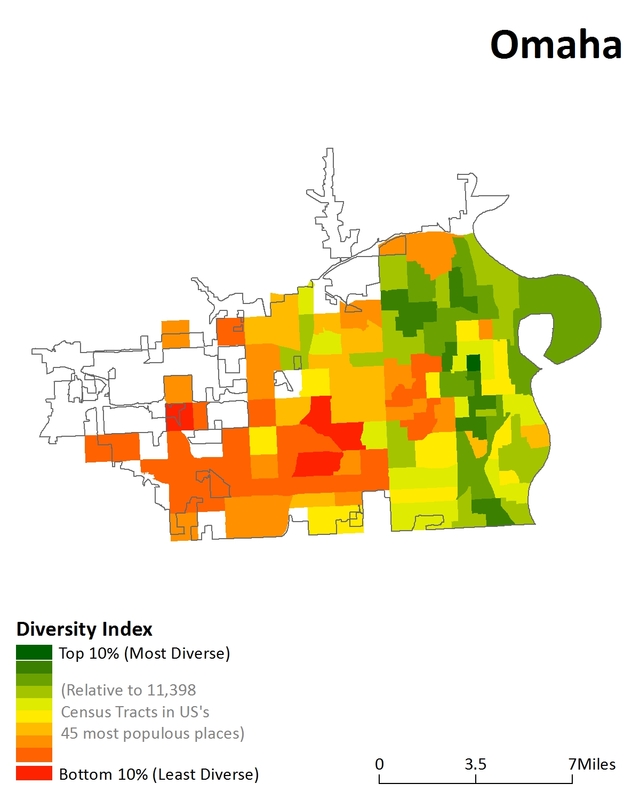 The clear differences between how black and white residents born in the District have moved around the United States highlight important elements of our history. 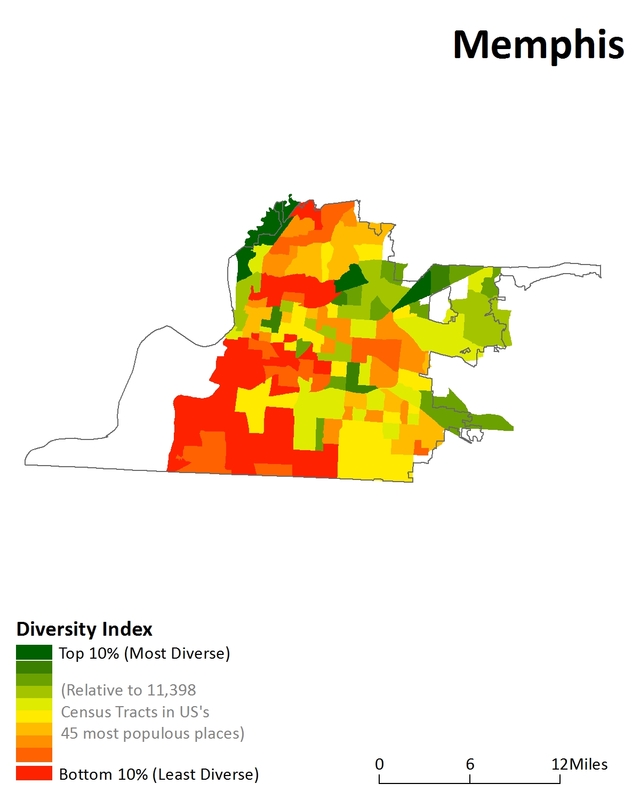 The steady flow of white Washingtonians out of the city, which accelerated starting in the 1940s, reflects a population taking advantage of public policies designed to help them build wealth. 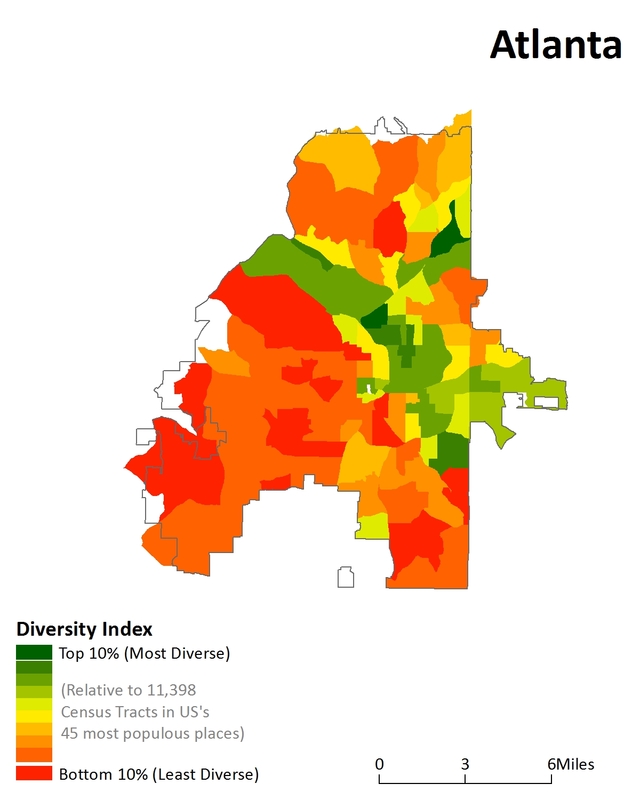 Meanwhile, black Washingtonians' lack of mobility illustrates how policy makers discriminated against blacks for at least another three decades while their white counterparts solidified their middle-class, home-owning status. 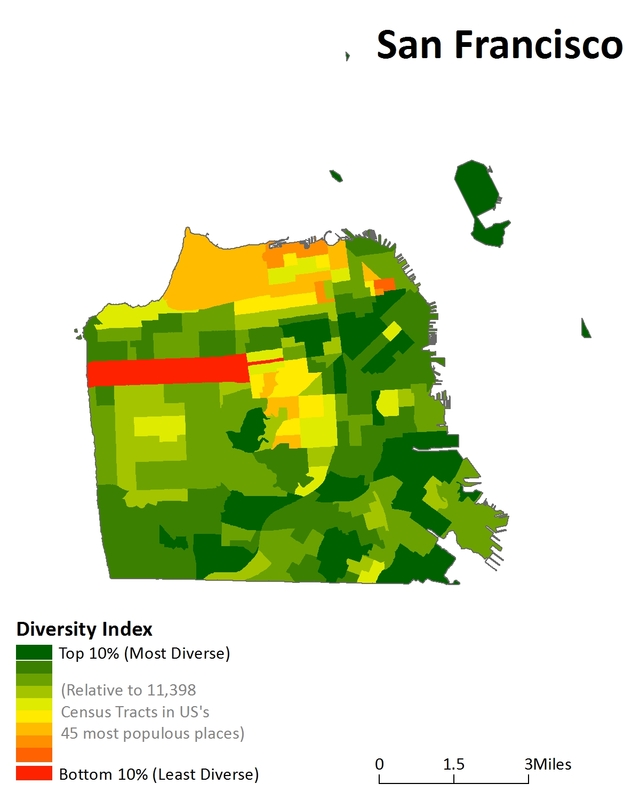 These charts tell the story of blatant institutional racism targeting blacks 40 years ago, not 400. 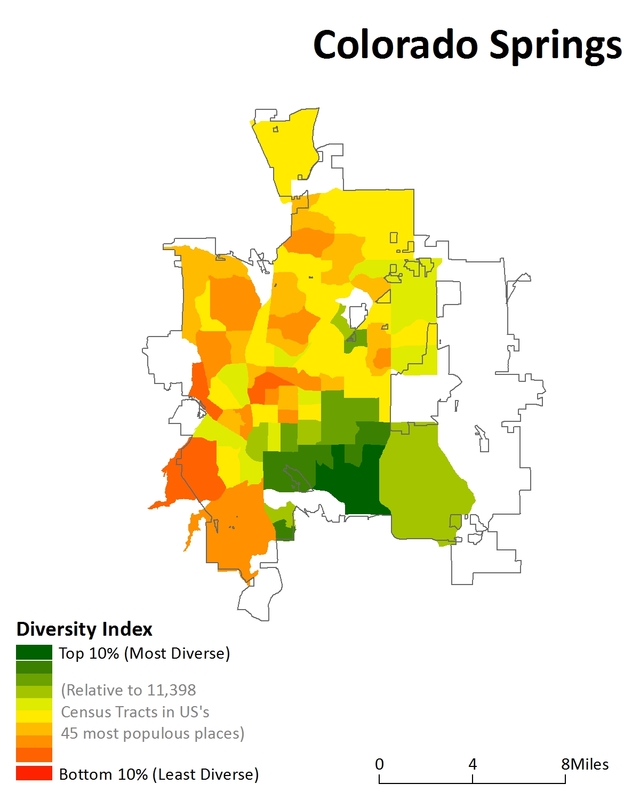 Access to education, employment, wealth, and safety are closely tied to geography. 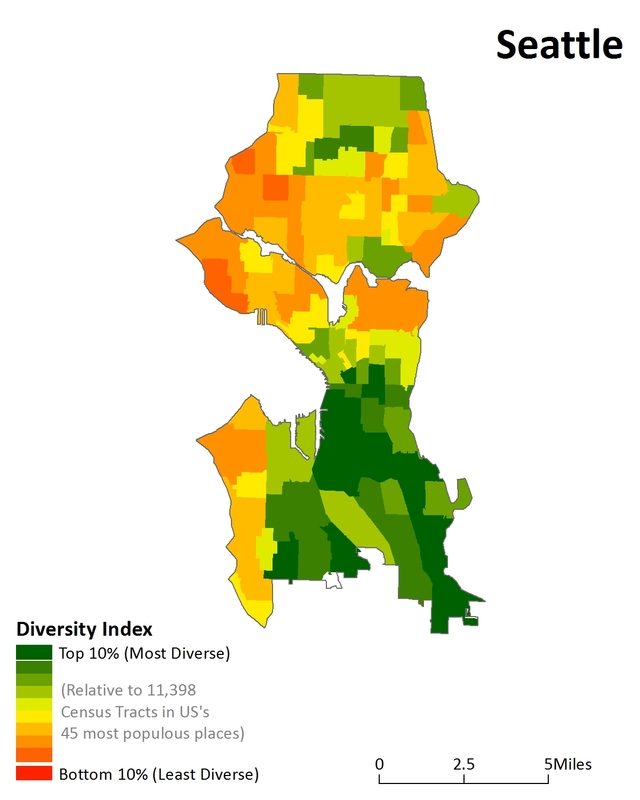 It's imperative that our current and future public policies foster access to these opportunities for black Washingtonians and other traditionally excluded groups so that the next version of these charts conveys progress rather than continued inequality. 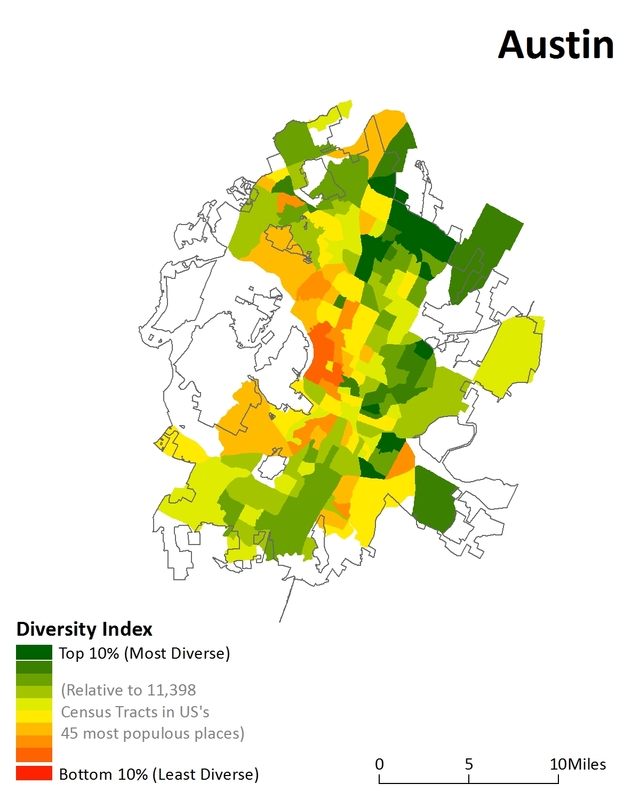 The diversity of each census tract in DC. 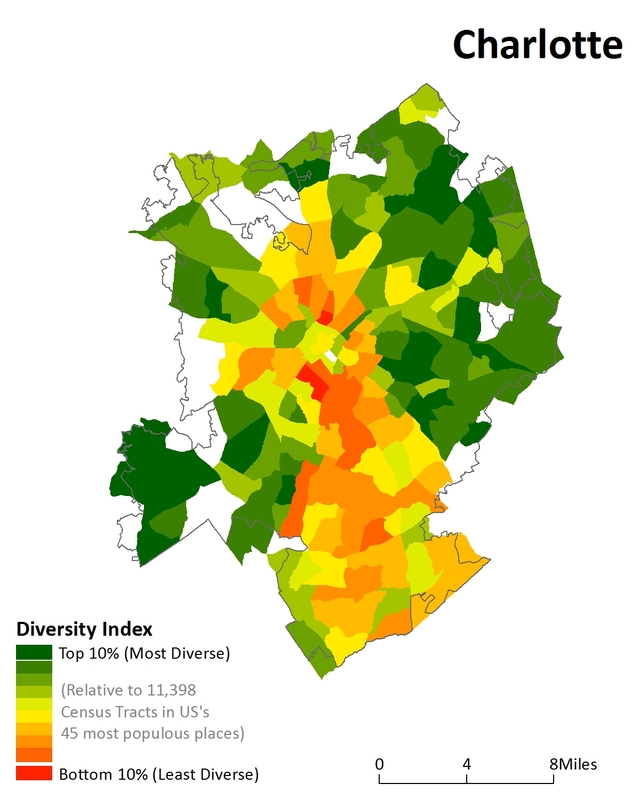 How do you measure a city's diversity? 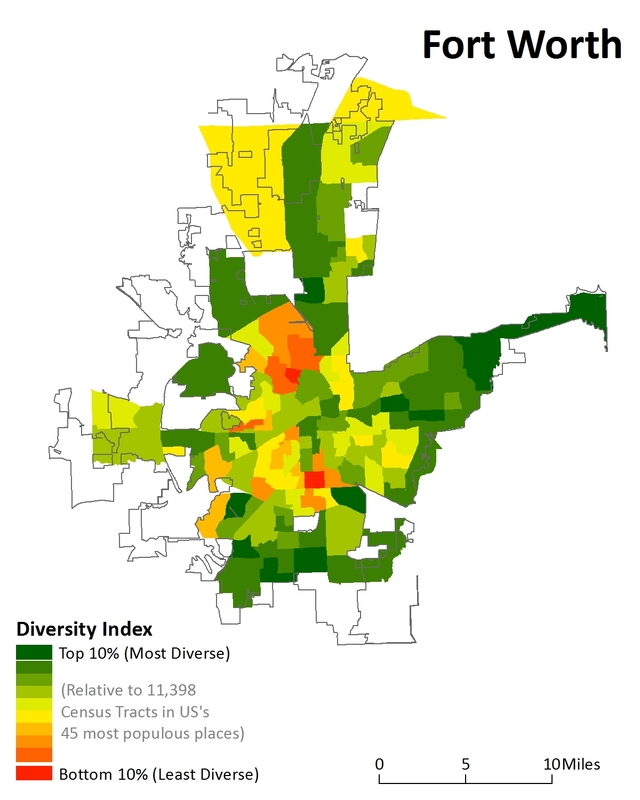 If a city has a lot of different racial and ethnic groups in their own segregated sections, is that diverse? 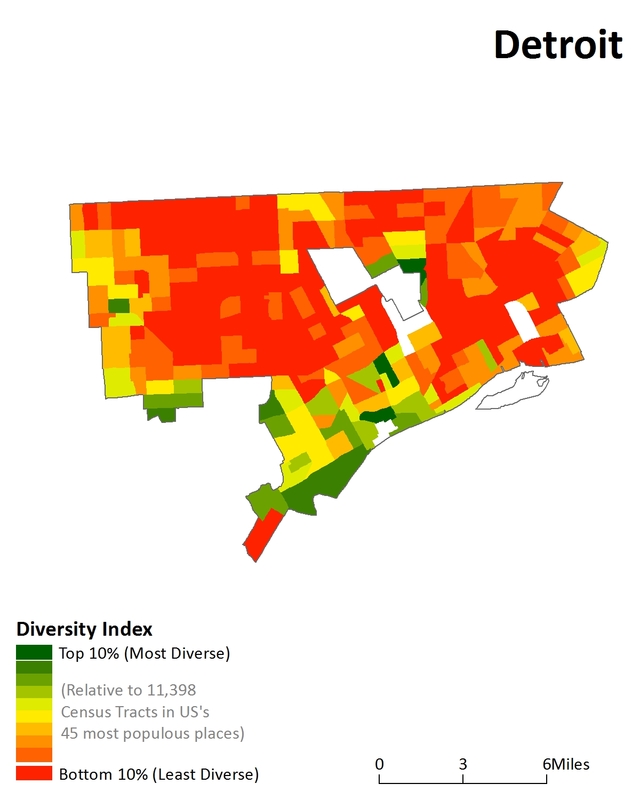 A blog called priceonomics recently ranked major American cities on diversity by looking at the percentage of major racial and ethnic groups within the city's limits. 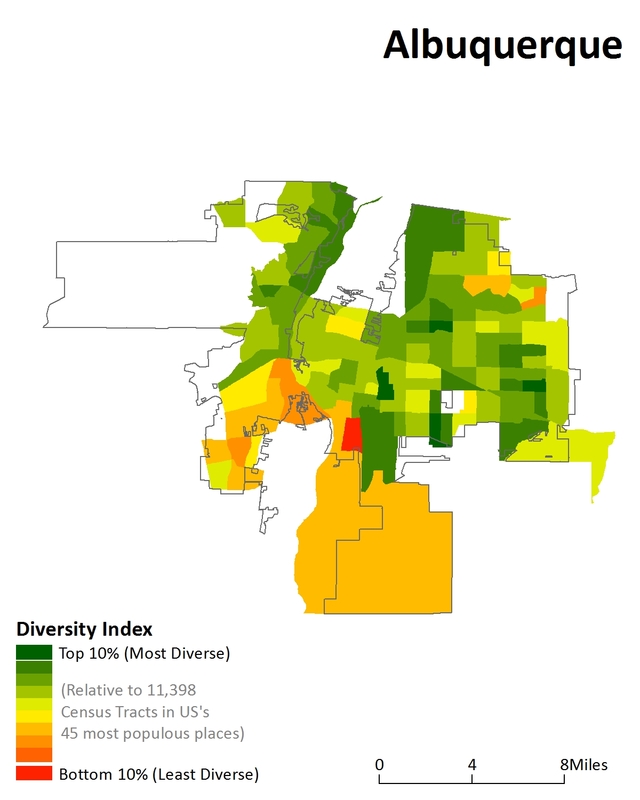 The District of Columbia came in 21st, slightly less diverse than Oklahoma City. 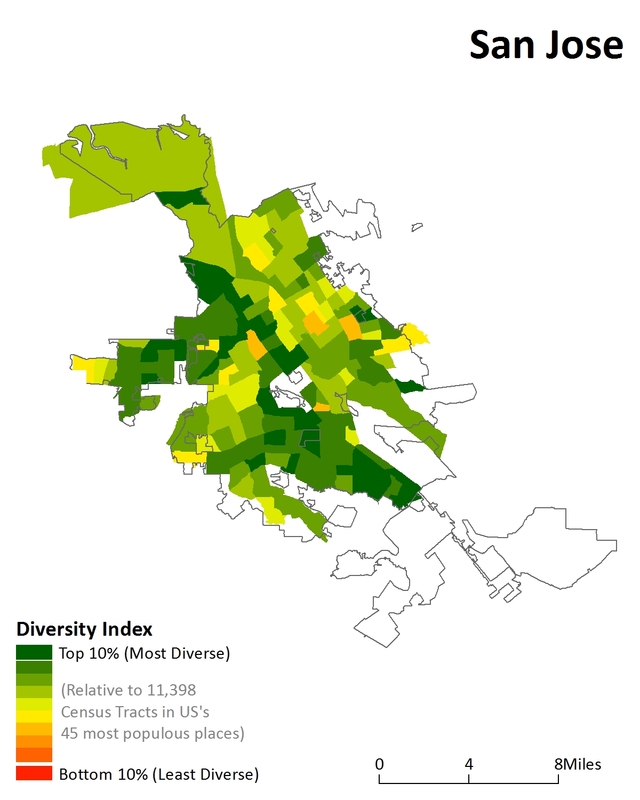 However, while this analysis is useful, it it doesn't reveal whether the neighborhoods in each city are themselves diverse, or whether the city boundary just encompasses some all-black areas, other all-white areas, and so on. 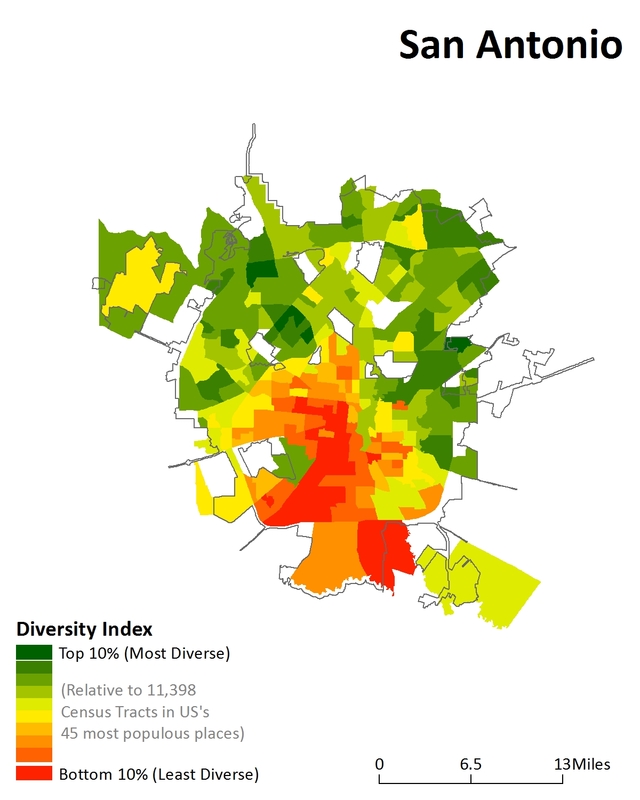 If we modify this methodology to measure the average diversity of a city's neighborhoods, rather than of the city as a whole, we are able to quantify how integrated these place are. On this new measure, the District performs even worse. Consider Chicago. 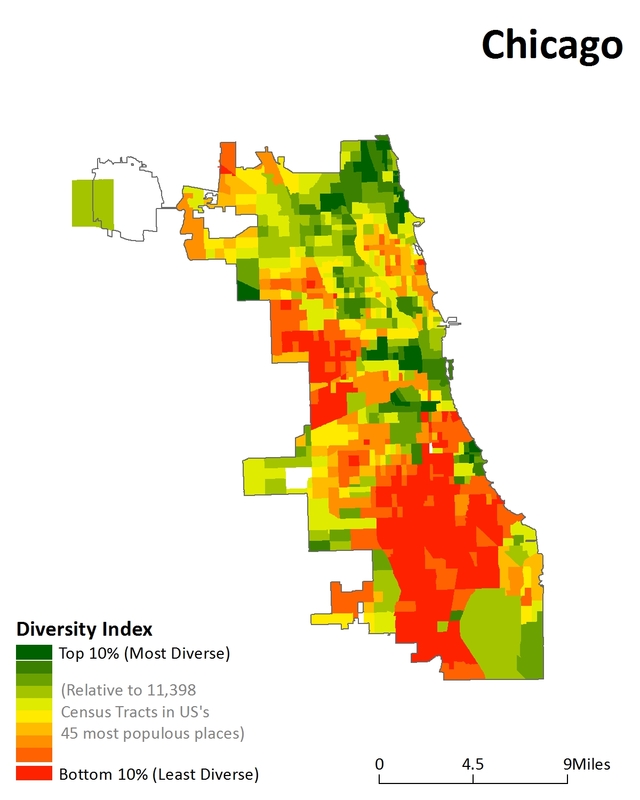 With roughly equal-sized black, white, and Latino populations, the Windy City ranks as the fifth most diverse city in the country on the priceonomics scale. 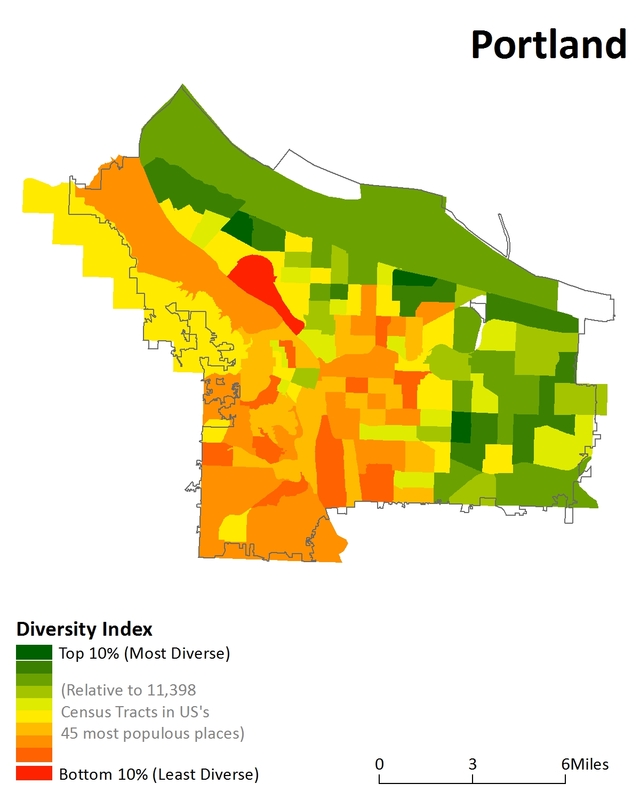 However, if we instead use priceonomics' same methodology (it took the percentage of black, white, Asian, Latino, and other people in the city, then used a Herfindahl-Hirschman Index to combine those numbers into a single score) for each of Chicago's individual census tracts, then take the weighted average, Chicago suddenly drops to 38th out of 45. 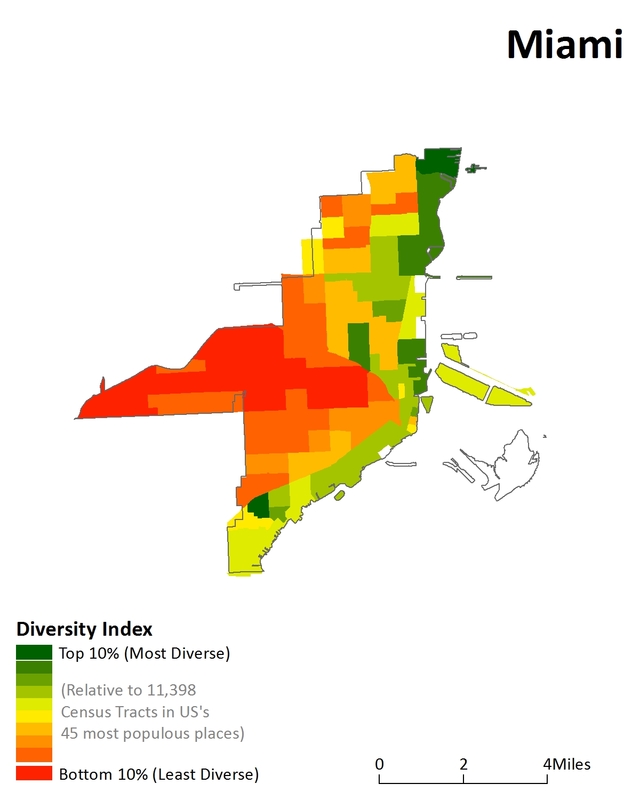 Note: Priceonomics used the 2013 1-year American Community Survey estimates for their analysis. 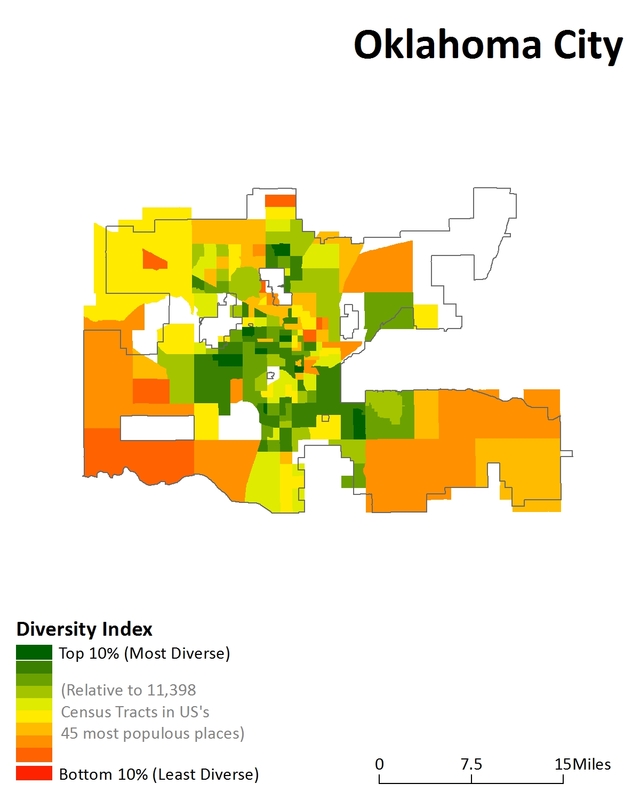 This analysis uses the 5-year estimates, because it is available at both the Place and Census Tract levels. 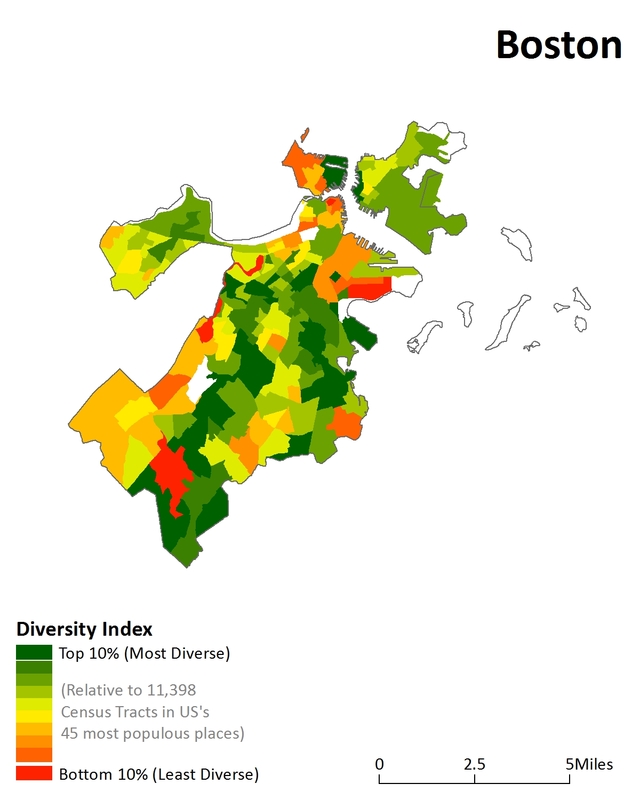 As a result, the citywide index scores may vary slightly from the data presented by Priceonomics. 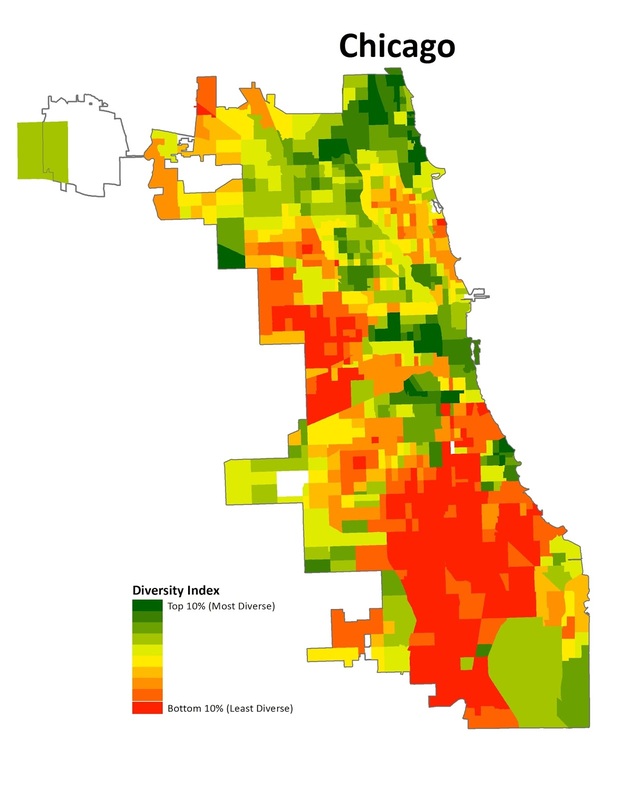 Chicago, as a whole, is diverse, but its neighborhoods are not. 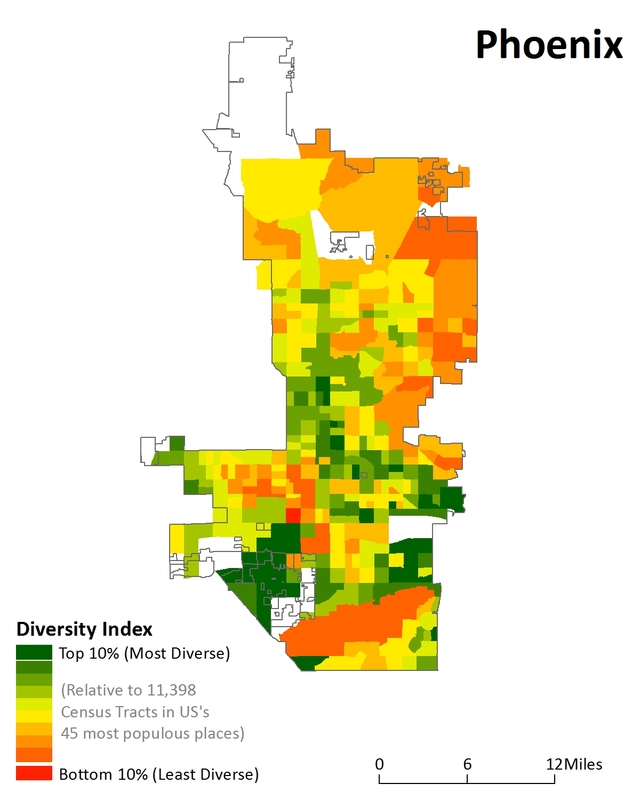 The average Chicago census tract is less diverse than a typical tract in Portland or Colorado Springs, both relatively homogeneous cities that scored near the bottom in the original citywide index. 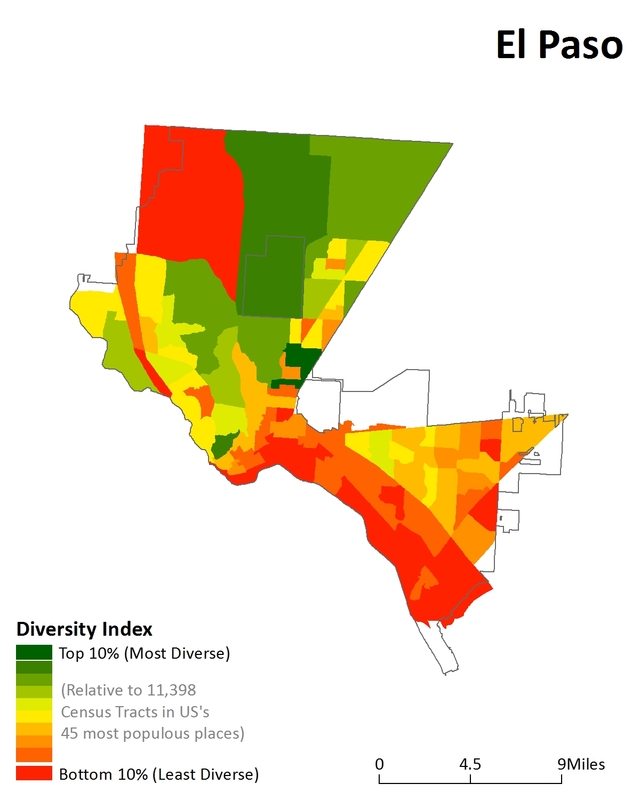 Both are close to 70% white, but the non-white population isn't all clumped in a small non-white area. 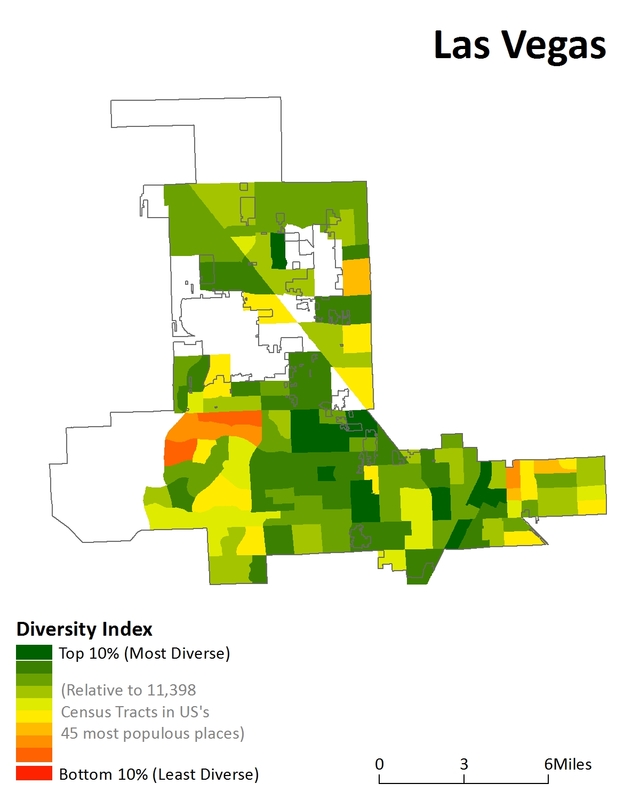 Chicago's diverse population is largely segregated. 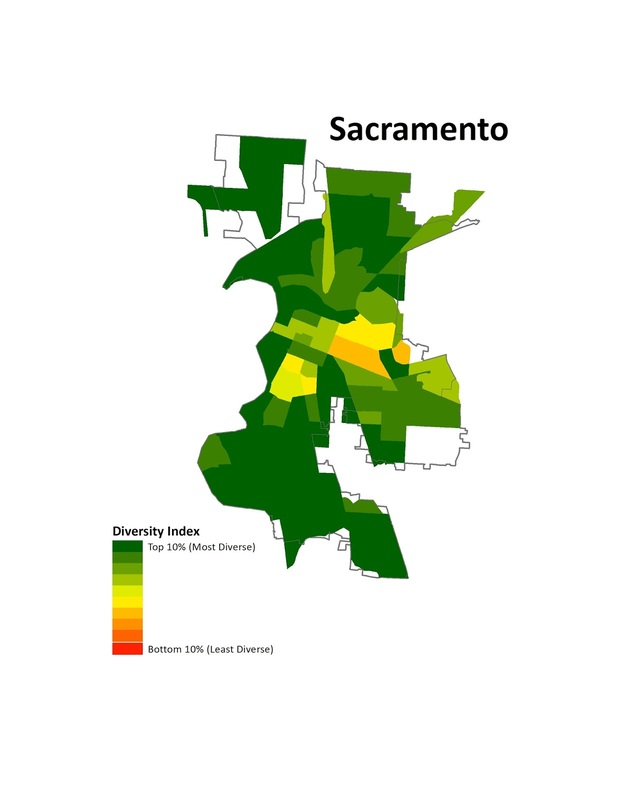 Sacramento is diverse, and so are its neighborhoods. California cities dominate the adjusted rankings, accounting for the top six spots: Sacramento, Oakland, Long Beach, Fresno, San Jose, and San Francisco. 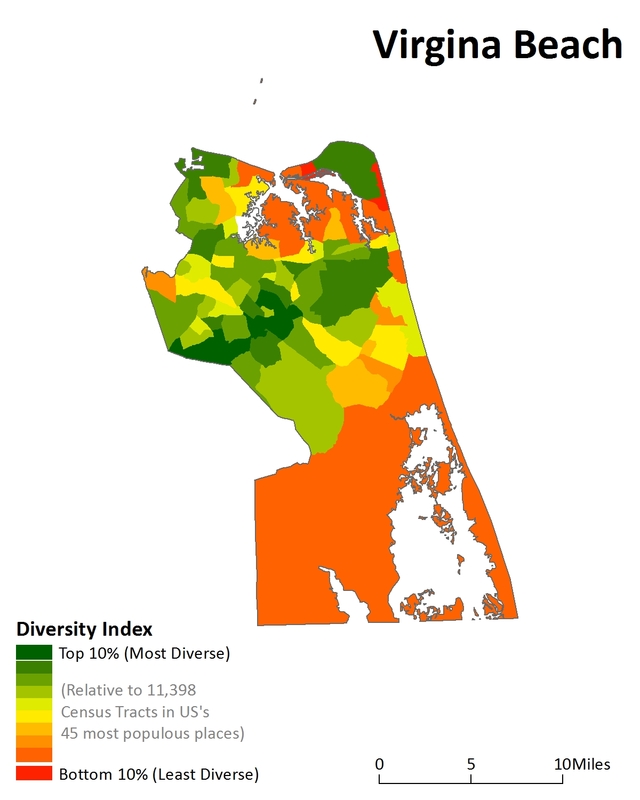 Virginia Beach moved up 18 slots, representing the largest jump of any one city. DC, on the other hand, drops into the bottom quartile, neck and neck with Omaha. 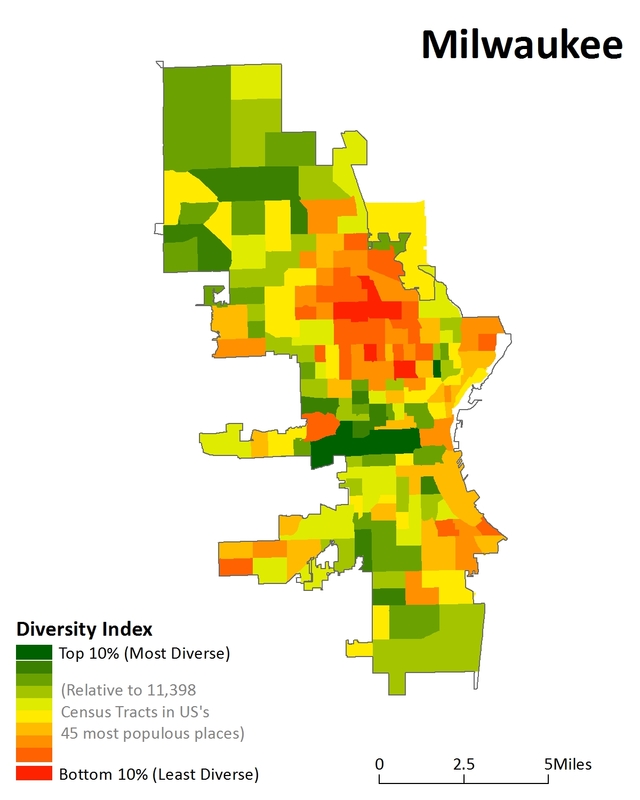 Like Chicago (well, not quite as bad as Chicago), the District's citywide diversity doesn't extend to diversity within most of its neighborhoods. 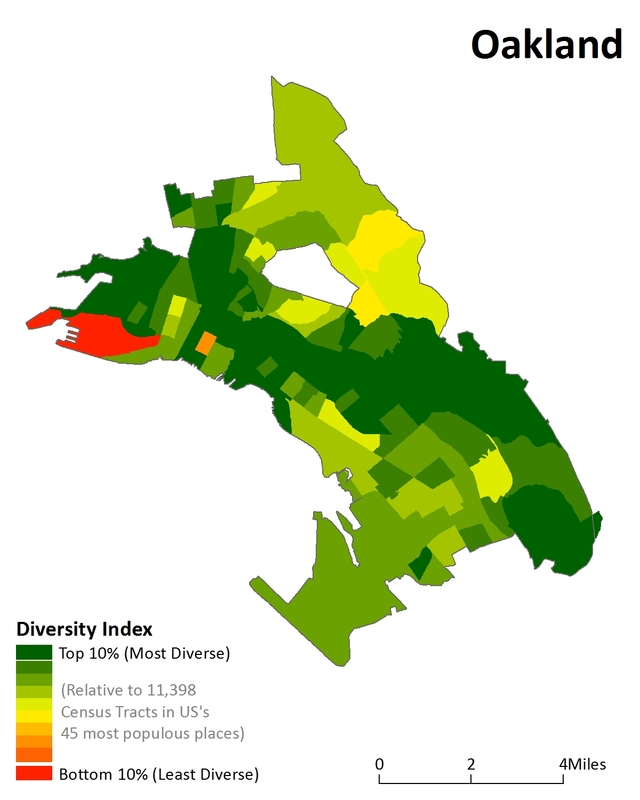 Diversity within neighborhoods compared to overall city diversity, with the most integrated and most segregated cities labeled. 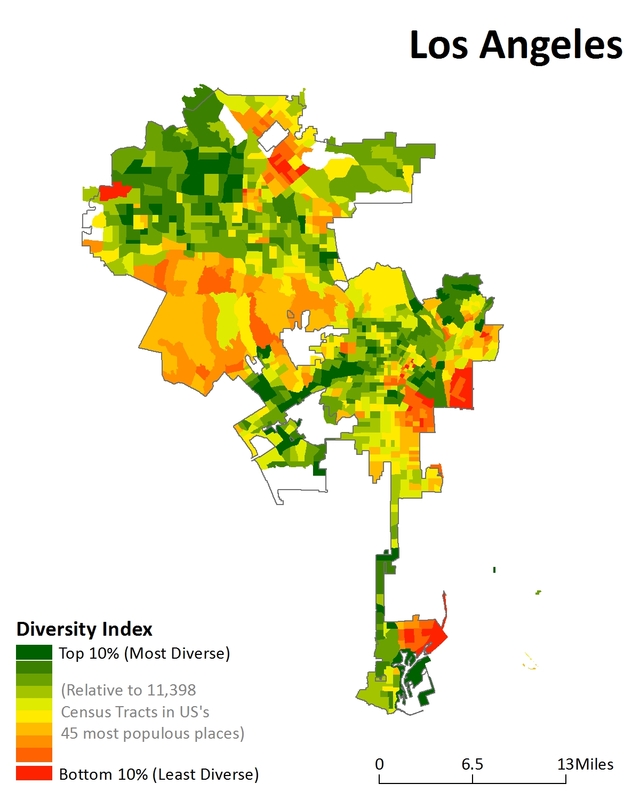 Cities above the trend line have less diverse census tracts than the city's overall diversity would suggest. 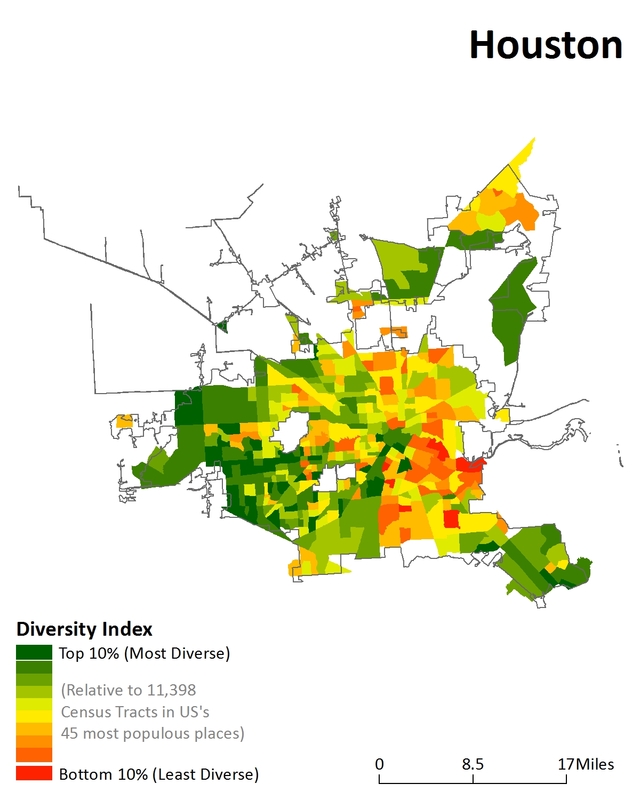 These are therefore relatively segregated. Chicago and DC fall into this category. 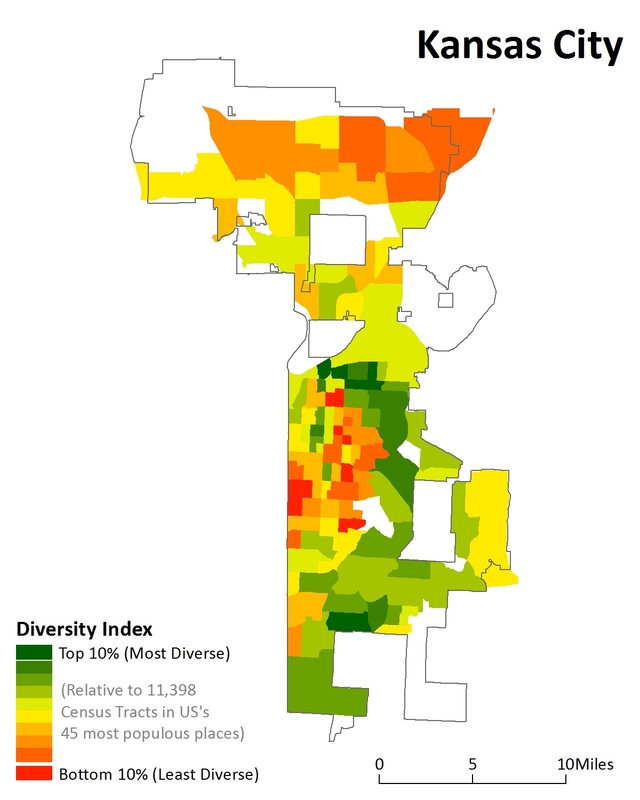 Miami is among the least diverse cities on the entire list (remember that according to this methodology, "diversity" only considers 5 distinct groups, lumping together, for example, everyone who identifies as Hispanic/Latino), but on a neighborhood level it's even more segregated still. 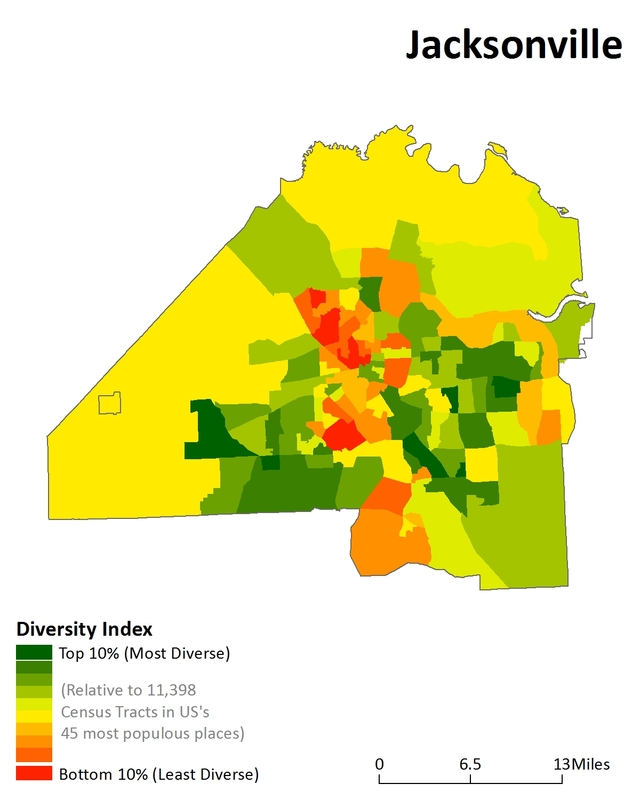 Cities below the trend line have neighborhoods that are more diverse than comparable cities at their level of citywide diversity. 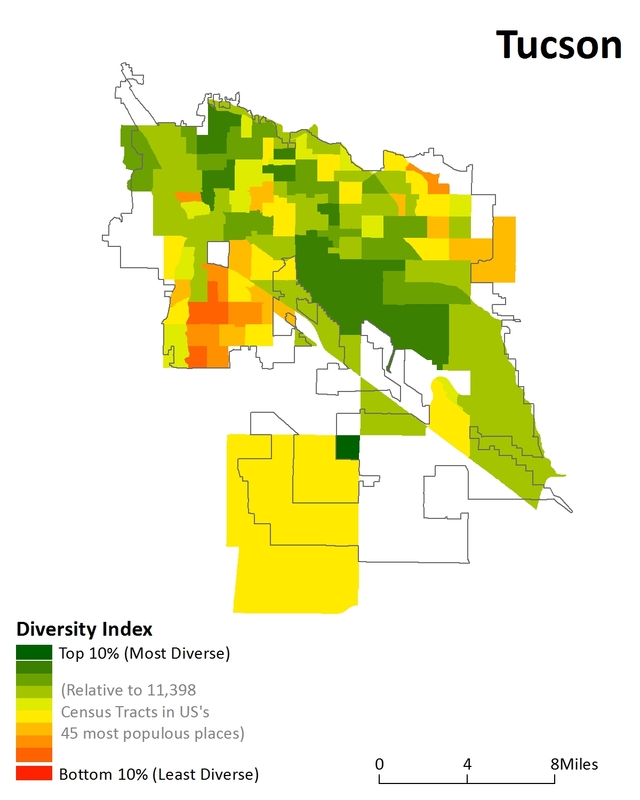 This group includes Sacramento, which is both diverse and integrated, as well as Portland, which is not diverse, but relatively well-integrated. 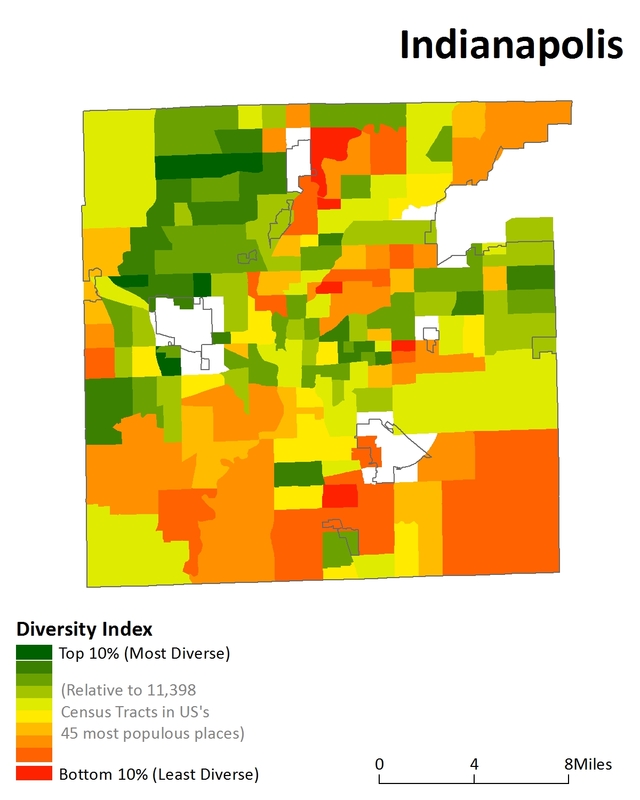 Diversity and integration are both important, and the District has a long way to go on both measures.